Is it just me, or do the short weeks seem busier than regular five day workweeks? My theory is that it feels that way because we all have to squeeze more work in to fewer days. Even so, I am not sure I would trade a three day weekend for a five day workweek. Anyhow, enough of my crazy theories and on to more important things, like clothing and accessories. 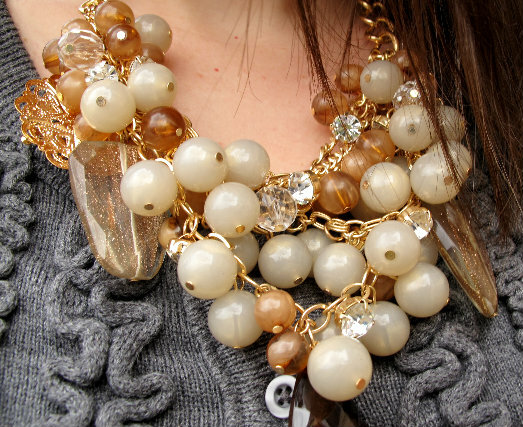 Today I am debuting one of my three Charming Charlie purchases as part of my 22nd outfit of my 30 for 30. If you have never heard of Charming Charlie before, like me prior to this past weekend, check it out. It's accessory heaven and perfect for those of us on a budget. Hope you all have a happy hump day! I love Charming Charlie! It's like a candy store! I LOVE that necklace. I totally might copy you and get it, too. I love Charming Charlie! And I love that necklace, it is super cute!! Found your blog from Lace, Etc :) Love how your tights match your sweater and your skirt matches your shoes, so cute! Following you now! a wonderful outfit! I love the cardigan and the necklace!